As a huge Philips Hue fan, I am always keen to try out new smart lighting technology. One of the issues I do have with Hue is that the individual bulbs are not very bright, and in our master bedroom with a pendant lamp, a single bulb barely lights up the room at night time. First of all, I should address the price, this costs €699 which is about £610, and for me, that is a huge amount to spend on a lamp. So, this isn’t exactly a cost-effective buy, but it isn’t awful either. The RRP of a Philips Hue E27 bulb is £50 and you, in theory, would need at least 5 of them to achieve close to the brightness of this plus the cost of the fittings. Most people won't use that many E27 bulbs in one room so the colour GU10 will set you back £50 each too, and in theory, this would require around ten bulbs to achieve the same. These are not like for like products, but the shock of the initial price isn’t as bad as it seem. Also, you can easily buy a designer lamp from places like John Lewis which cost more than this without any bulbs. 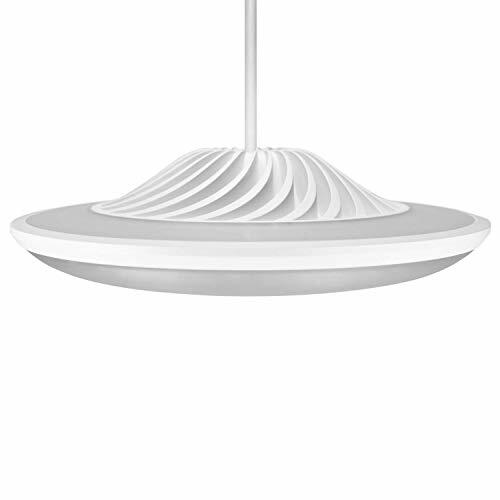 This lamp is a fully integrated unit, so there is no need for bulbs, but it means you are stuck with the design. I am on the fence about how I feel towards the design, it is perhaps more functional than anything, and if you like a modern looking lamp then this will probably work for you. With this being a complete pendant lamp, it needs to be wired directly into your home wiring, my DIY skills are poor at best, but fitting lights is relatively easy and safe as long as you switch off the power to the lights at the mains. With all the LEDs being built in, this is quite a heavy lamp, so when you are installing it some consideration will need to be taken into account where your screws go. I would say ideally you would want to get it into a wooden joist. The lamp does come with proper fittings though, which includes plastic plugs and this is probably fine for plasterboard (but don’t take my word for it). Once you switch the power back on you can begin the setup, the lamp uses Bluetooth, and you will need to download the Luke Roberts app to get it working. The app immediately detected the lamp and I was able to control it straight away. You will need location access so that the lamp can align with the directional LED settings within the app. The app has several default scenes similar to how Hue works, so there are options such as shiny, indirect, reading, and bright. For me, one of the more useful options was the indirect setting, I am quite sensitive to light in my eyes and it can trigger headaches, the indirect option switches off the downlight completely, firing the light upwards. You can manually select the settings of each scene with a long press which can then get a little confusing due to the range of customisation. There are two circles you can select, one for the upwards and one for downwards LEDs. Long pressing on your chosen circle allows you to choose the colour, with the downwards option the settings are limited to temperatures of white/yellow. But the upwards one you have blue, red, pink, green, etc. So selecting blue you can then paint the circle, and it will change the LEDs as your paint. This allows you to have multiple colours in use at the same time. Then on the bottom right you can hit a button to alter the brightness or rotate the LEDs. This is an extremely unique feature, and Luke Roberts advertises it as painting the walls. It is definitely fun to play with at first but for me after the first few attempts, I didn’t bother with it. The settings get saved to the scene, so you can customise a scene to your liking then never need to adjust it again. Due to the huge number of LEDs the overall performance is fantastic, the bright option is almost painful to look at, and it easily lights up the entire room by itself. I have even found the indirect upwards firing LEDs more than capable of lighting up our bedroom. It is worth noting that on the max brightness setting this will use 75w of energy, so you wouldn’t want to leave it on all day like this. While everything works as they advertised, and the app is easy enough to use, there are some issues I find off-putting. There is no hub, and it doesn’t use Wi-Fi, instead relying on Bluetooth, while this makes it convenient to install and set up, it limits what other systems can work with it. With Hue there are all sorts of accessories including light switches, PIR sensors and nearly all smart home tech integrates with it, plus the Hue hub is always connected via ethernet. It is quite rare that I go into the Hue app, if I walk into a room I find that rooting my phone out, loading up the app and switching on the light is considerably more time consuming than pressing a button. There is a lot of like about the Luke Roberts Lamp, it is certainly the most unique smart lamp I have used and its lighting performance is unmatched as far as I am aware, making it a good solution if you only have one light source in your room. It is easy to use and the app works well, you can even carry on using a traditional light switch while maintaining the ability to control the scenes. However, it does cost a lot of money and will be far too expensive for most people. While it doesn’t offer great value for money, I don’t think it is ridiculously priced once you factor in its performance compared to other smart bulbs. My main problem with it is the lack of cross-platform compatibility, this is something the smart home industry faces as a whole, and this lamp is a particularly good example of it. While it is nice not to have another hub to plug in, the Bluetooth interfaces severely restricts what other systems can communicate with it. This appears to be something that Luke Roberts are working on, but with them being a relatively small company I suspect any cross-compatibility development will fall on Luke Roberts head, rather than other systems actively trying to integrate with them. While this lamp will struggle to work seamlessly with a smart home, its unique design and functionality have a particular wow factor, and if you want a statement lamp with some smart credentials, then this is worth considering.